Paul has been a Martial Arts Practitioner for over 40 years. Paul is The Chief Instructor of the Samurai Enlighten Musin Karate Academy and is graded 7th Dan in Wado-Ryu Karate and teaches 250 students around the West Sussex Area. He is also 1st Dan in Iaido, Reiki Master and Instructor of T'ai Chi Ch'uan and Chi Kung. He is one of the Senior Instructors and Chairman of the British Wado Federation. He has trained in a particular style of Japanese Swordsmanship (Muso Shinden Ryu, Iaido). 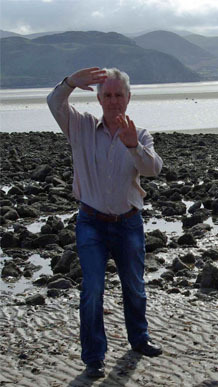 In Tai Chi he studies with his Tai Chi Instructor Alex McGrregor who obtain his Tai chi skills from both The London School of T'ai Chi Ch'uan and The British T'ai Chi Ch'uan Association. My Name is Paul Elliott I have been studying and applying Martial Arts practice since 1973. One day practising a fast form which had slow movements I felt a tingling, or 'invisible force' between my hands, which later on I discovered was my Chi. From that day on, I became fascinated about what Chi is and have spent the rest of my life investigating Chi. Since that day my hands tingled. I have attended various courses on Healing, and Meditation. I have discovered that Chi can assist within the training of Martial Arts, Illness, Disease, Clearing Emotional blockage and aids positive thinking. I have also found that working with Chi provides a healing of its own for self healing, or to give healing through the universal life force Energy = Chi = Healing. Since 1973 I have progressed to 7th Dan Black Belt in Wado-Ryu Karate, 1st Dan Iaido, Tensho Chi Master, Healer Member within NFSH (National Federation of Spiritual Healers) and a Reiki Masters Teacher. I have also taught Tai Chi for Aspire Sussex, an adult learning facility that teaches across all ages and abilities including helping those for mental well being. Also within Tai Chi different forms of meditation are taught to help calm and relax the mind and heal the body.